Here's another super fun tutorial from Jessi of Sweetie Pie Bakery! Thanks for sharing, Jessi! I had the Anna Maria Horner Study Hall Skirt pattern in my stash and really wanted to give it another go. I wanted to make it less juvenile and more dressy. I thought that doing something monochromatic but playing on textures would do just that. For the main skirt I used a black Kona cotton and a satin for the pleats. I think I'll get a lot of use out of this skirt. The only negative I have against the pattern is that it was a tad big. I even made the smallest size but it still feels a bit too loose...in the way that it might just spin all the way around while I'm walking. For the top, I needed something super fast. I was inspired by these tanks in this etsy shop by designer Clairelafaye. They are so girly and fun. In the end, I chose to just cinch up some chiffon and sorta snake it around the neckline, giving it a bit of an asymmetric look. I hand stitched the chiffon onto an $8 tank top from Target right on the dress form-so simple! So cute, fun and fast!! 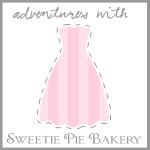 Be sure to check out Jessi's blog Sweetie Pie Bakery and look for more Adventures with Sweetie Pie Bakery here on Adventures in Dressmaking! So simplistic but so pretty! Love it! mess. I think I will try it with one solid and one print for my first go round. I am all over that tank! Hope your new job is treating you right!!! OMG! I LOVE the top so much! Thanks for sharing. What an easy and cheap way of getting a lovely outfit! It looks really nice. I do love that tanktop. Lovely!! The tank is so beautiful! It has the best combination of price, speed of sewing and style. Perfectly! Fantastic use of the skirt pattern! At first I thought Kona cotton wouldn't look polished enough next to the satin, but it looks amazing! And what a great idea for transforming a cheapie tank. I'm totally stealing this.